Another Aussie! Ariel and his team are from Brisbane, which is in Queensland, Australia. The product that Cartesian Co makes is called the Argentum. Formerly called the EX1, when it was raising money on Kickstarter. They are currently on batch 4. 200 total have shipped, 80 went to Kickstarter backers. The Argentum uses 2 part ink vs 1 part ink (nano particles) make by companies like Dupont, Mitsubishi and Mithode. Currently these only are advertised to print on pre treated materials. The printer itself uses old inkject cartridges to deliver the inks. The focus was on an MVP…just like in Southpark. The reason for using silver is copper chemicals are much more dangerous to handle. Cartesian is planning on creating multi layer boards using insulative ink in selective areas. One interesting future avenue is printing on fabric/paper. The paper can even be reflowed. A current issue is stringing, which causes unwanted shapes on a print. The specs – 20 mil space/trace. Dave was interested about the business setup moving to the US. Cartesian is setup as a corporation in Delaware, as many are. Apparently internet denizens can now also apply to be part of Estonia as a digital citizen. We were of course discussing “Fartesian Faux, Inc” in all of these discussions. Though investment in startups is changing via the JOBS act, it might not be as much as people expect. Public/general solicitation is still very restricted, especially since the SEC rewrote some of the rules. 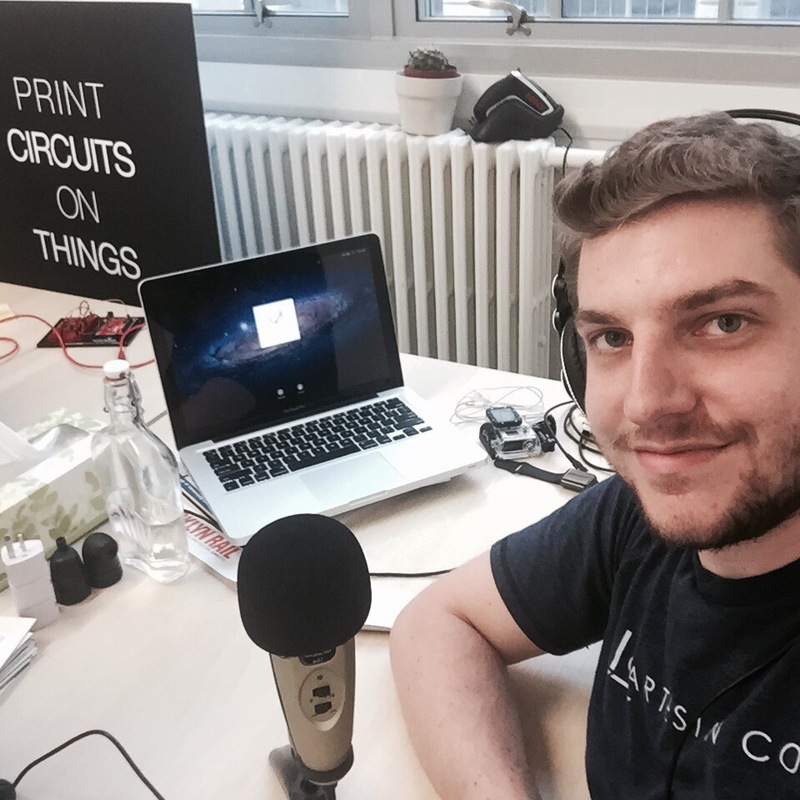 Many thanks to Ariel for telling us more about circuit printers. It seems like the desktop technology has some fun years ahead. Chris is looking forward to getting his skin printed on and eventually getting a Cartesian chip printer. Wikipedia says silver nitrate reacts explosively with ethanol, which would explain the fire printing. Ariel did mention their fingers get black when working with the cartridges but that it doesn’t ever have any lasting damage. I assume this is how they figure out they could print on skin and I volunteered to be the first sucker. Am I the only one who hears a high frequency background noise on most of this episode? Listening again, I totally hear it. Could be the CODEC picking up noise since Ariel was in Brooklyn. It does weird things with background noise. Or could have been a power supply on a laptop or something. Sorry about that! Good, I’m not crazy. I was trying to pick it out on Audacity’s spectrum analyzer. It didn’t show it. No IC of the week ?? I am a RF engineer, I worked for a company that spend more money on software than employs. Having something that could make boards in a couple of minutes would save money in just electricity for computer power not even counting human time spend waiting for boards made.